Neymar, Harry Kane, Lionel Messi—each of them is worth well over $100M for their innate talent on the soccer field. Such high-profile players are expected to perform at the top of their game in the 2018 World Cup, but they got us thinking of a new way to view the competing teams. Instead of individual talents, what if we looked at the total value of all the players on a given roster? We originally found the numbers behind our visualization at transfermarkt.com, a site that tracks and measures the worldwide marketplace for top soccer players. We used the website’s numbers to create a unique map of talent at the World Cup. The size of each country represents the total value of the players on the national team, with the color corresponding to the region. We also threw in the national soccer emblem from each country just for fun. Our map reveals a few surprises about the teams competing in the World Cup. First off, there is a great deal of inequality between the rich countries in Europe and the rest of the world. And in fact, 6 out of the top 10 countries are from Europe. This makes a certain amount of sense given how European soccer leagues tend to pay the most money for top talent. We would expect people who grew up playing soccer in Europe to remain close to home as professionals.But just look how much bigger the blue European countries are compared with the green African. Take an actual example from the World Cup. Spain ($1,055M) is scheduled to play Iran ($45M) on June 20. The Spaniards are worth more than 20 times as much as the Iranians. We doubt it’s going to be competitive. At the extreme low end, Panama’s roster is valued at only $9M. A second and related issue concerns the relationship between player valuations and talent. Remember, national teams don’t pay their players much if anything—these guys make a living playing for professional soccer clubs. 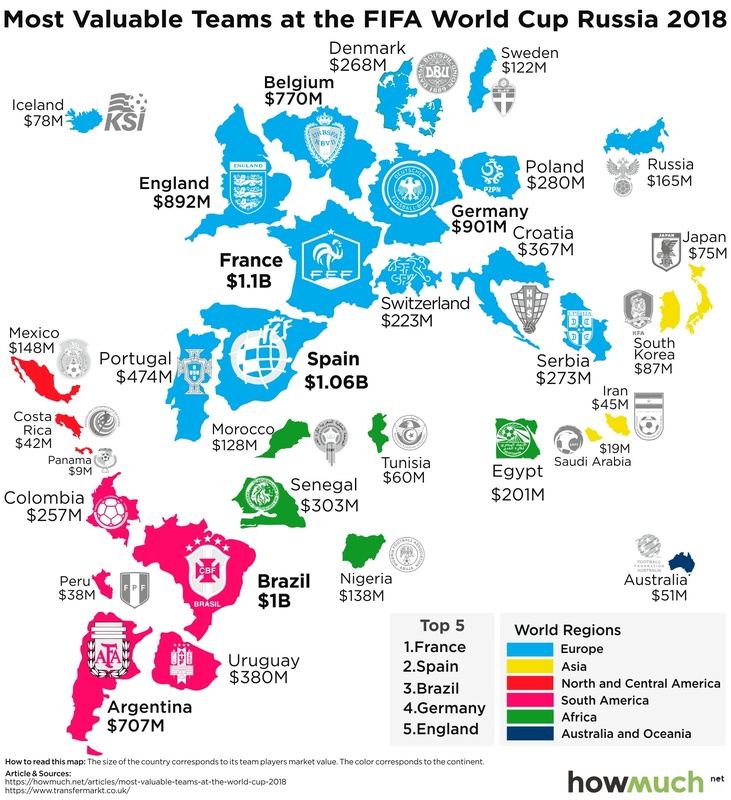 So if the market is accurate, we would expect those countries with the richest players to win most of the time. Taking a look at the history of World Cup winners reveals that to be the case: over the last 80 years, the only non-European teams to even make it to the final of the competition have been Brazil and Argentina. And even then, both of those countries are loaded with millionaire talent. The last World Cup final game without a European team was way back in 1950 (Uruguay over Brazil, 2-1). Clearly, money buys talent, which in turns wins World Cups. What can this tell us about who is most likely to win the 2018 World Cup? It depends on how teams emerge from group play, but the one team with the best chance to win it all is at the top of the list: France. The French roster is worth more than the entire bottom 14 teams combined. With over $1.1 billion in talent, it will be nothing short of a catastrophe if the French side doesn’t at least make it to the knockout rounds.